Aristotle wisely said that educating the mind without educating the heart is no education at all. I strongly believe in this. Beyond any achievements my child can ever attain, nothing will make me happier or prouder than knowing he turns out to be a genuinely good person. I dream that someday he will find a way to live a fulfilling and rewarding life while also helping the underserved. Raising such a child does not happen overnight. It takes years of constant and deliberate effort and even then, there are no guarantees. One can only fervently hope that the seeds planted will continue to grow and thrive. With this vision of the future in mind, I had to make it a goal to incorporate service learning and empathy-building opportunities in our blended education. Here are some suggestions on how it can be done based on our own experience. Create relevant experiences which are not only enriching and enlightening but also fun. With young kids, helping others should be fun if you want them to be excited and to do it again and again. Arrange for your child to do it with his friends because this makes it even more exciting for him or her. Halloween and Christmas Parties doubled as Play-and-Learn Missions where our kids got to play games, create art and made happy childhood memories together with under-served beneficiaries from partner organizations! Random acts of kindness work. 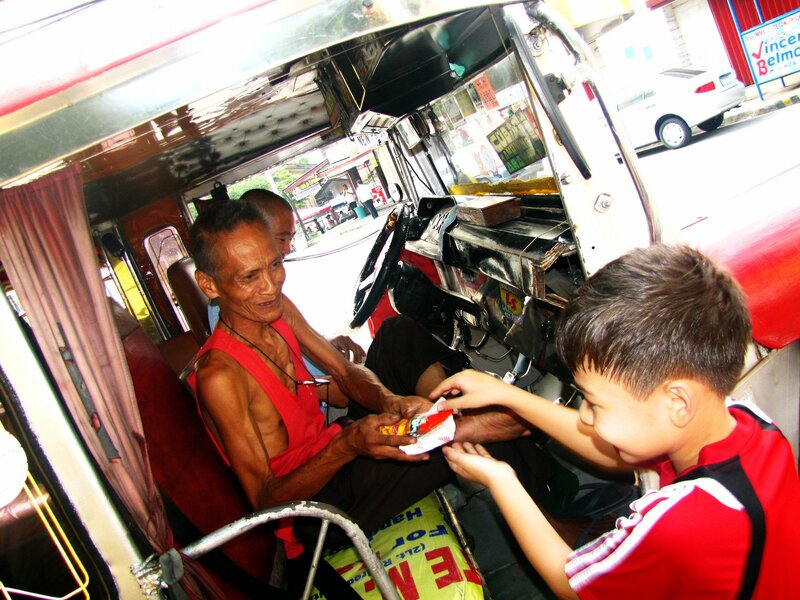 They could be a simple answer to, “How can I make someone smile today?” We let the kids experience what it feels like to make a random person happy, for example by handing out snacks to tricycle and jeepney drivers. It was quite easy to do but the impact was immediate and gratifying. Show kids that they can do something even as young as they are by using their own talents and gifts today. Inspire and motivate them to think of ways they can help with what they already have. Everyone can be an everyday hero! 4. Make them opportunities for creative learning. For example in one particular group project, kids were encouraged to think of what segment of the underserved population they wanted to help. They chose victims of child abuse and neglect. They researched on recipients. They decided to raise funds towards Educational Toy Chests to donate to identified centers. They created products for sale (recyclable mobiles, custom-made shirts, eco-bags, etc.) at a Bazaar and Festival which they themselves organized. They manned the booth, entertained visitors, managed the event and put the Educational toy chests together. After the event, they visited the different centers, personally handed out their gifts to their chosen beneficiaries and got to know about their stories and experiences. 5. Make them engaging and easy to connect with. What problems in the world are you most concerned about? Even adults get overwhelmed when they consider how big the world’s problems are and how little of an impact one person can do to make a difference. Start with what you know and care about most. Make it a goal to just touch even one person’s life. 6. Make them safe, kid-friendly and age-appropriate. Many donation centers require children to be of certain age to participate. 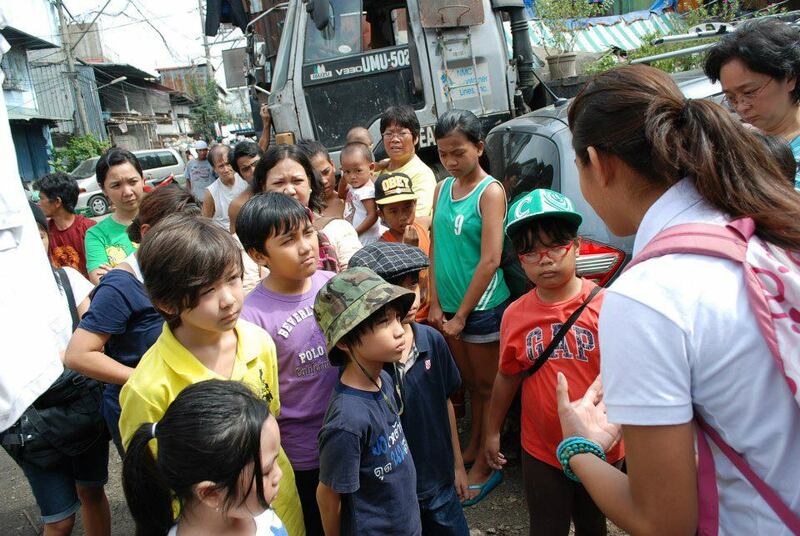 When disasters struck, our kids wanted to go and help out but because of their age, it wasn’t feasible for them for safety reasons. We decided to hold our own sorting and packing activities. Each one had a task and felt they contributed something to the group effort. Everyone even wrote personalized love notes to express their concern and care. 7. Make it possible for the kids to reflect and express their feelings about the whole process. Post-activity debrief and conversations are critical in helping kids understand the entire experience. In one of the cases, my son was encouraged to write about his experience. 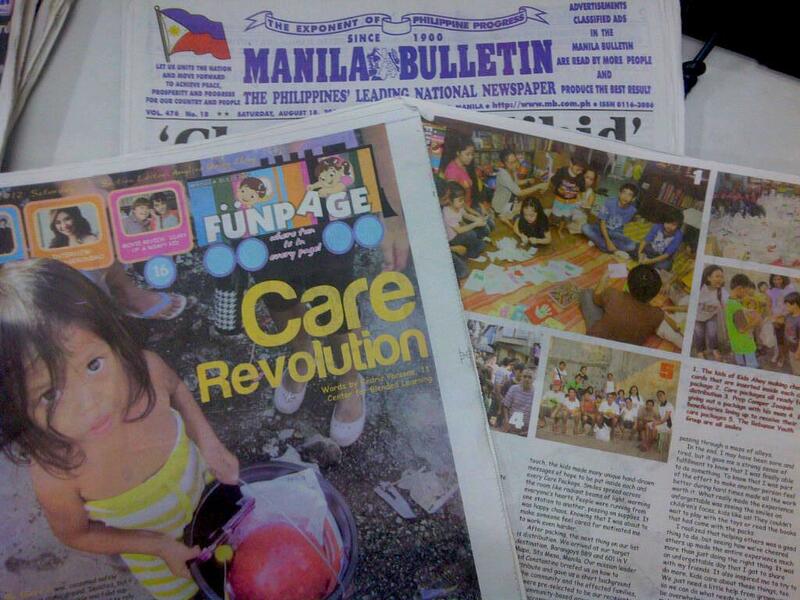 His article came out as a banner headline (Care Revolution) in the Philippines’ major daily, Manila Bulletin. 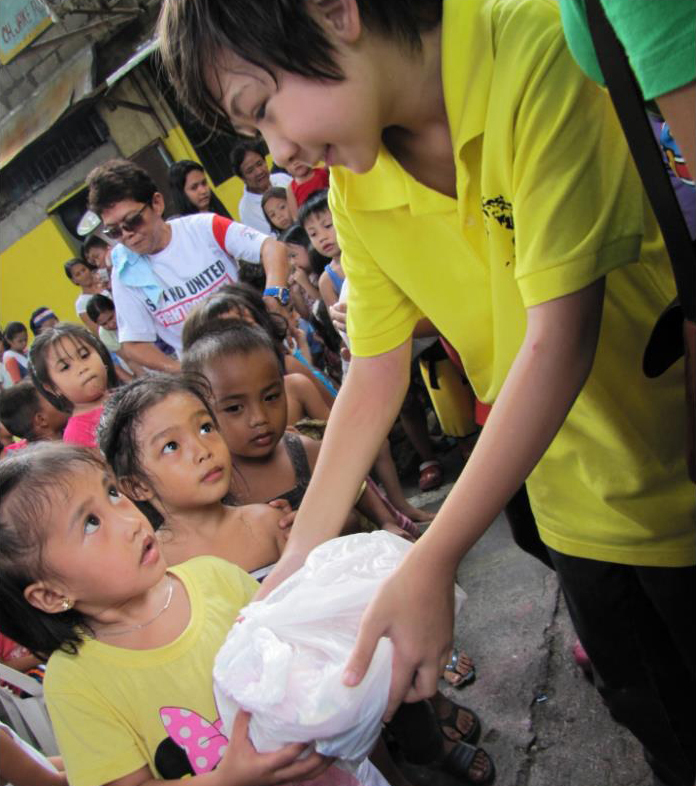 He felt even more empowered by sharing his insights and by encouraging others to help, too. 9. Involve the kids in the planning process of an outreach project. Guide them to decide on their own how they intend to go about reaching out to their intended recipients. This gives them a sense of ownership and pride in accomplishing their set goals. 10. Prepare the kids emotionally and psychologically. Do not focus on logistic preparation only. Consider how their young hearts can cope with potentially sad or even traumatic experiences. 1. We are the same. They love the same things as I am. They just do not have the same opportunities as I have. 2. Just because they have less doesn’t mean they are unhappy. 3. Even with how young I am or with how little I have, there will always be something I can do, something I can share. 4. Never take my blessings for granted. Be grateful and happy. 5. Happiness shared is real happiness. How have you nurtured and encouraged your child’s love for others as well as concern for global issues and problems? How do you envision your child’s life and what kind of impact do you hope they can have in the world? How do you intend to plant the seeds of compassion in your child’s heart today? For more photos of previous Reach Our Community Kids (R.O.C.K.) Play-and-Learn Missions, you can visit our Facebook page. Joanne Tupas-Parsons is the Founder of Kids Ahoy, a proactive community of parents, educators and kids and an after-school enrichment center which evolved into a Center for Blended Learning, an alternative education provider which were based in the Philippines. (Both are no longer active since she moved back to California in 2012 to follow her 14-yr old son’s lead as he continues on his hybrid schooling through High School and now Junior College.) She also founded a meetup group called Junior Apprentice Circle based in Southern California for teens and tweens. She is a Children’s Rights, Proactive Parenting, GiftED and TalentED, Play, Creativity, BlendED & Alternative Learning Programs Advocate. Her goal is to raise a global child, one rooted in and appreciative of his mixed heritage and with global skills, mindset and aspirations! Follow her on Twitter, Pinterest or Instagram.